Transition Westcombe: Wassail in the Pleasaunce! A ‘wassailing’ festival for young and old to celebrate and tend your community orchard. We’ll be mulching our park’s apple, pear and plum trees – then singing them good health for the coming year! As it's Twelfth Night for our wassail, Shakespearean actor and local resident Peter Hamilton-Dyer will lead us on a quirky route through the 12 Days of Christmas. Rich Sylvester and Nick Hunt will weave enchanting tales for young and old. Rich is a local storyteller, historian and forest school teacher. Nick is a storyteller, writer, wanderer and sometime bookbinder. Local singer Martin of Eltham Folk Mob will lead us in singing traditional wassail songs to bring good health to our orchard for the coming year. Calling all kids - come along to make your own headdresses and join the wassail procession! Bring old Christmas cards or anything else you think will help you make a colourful crown. 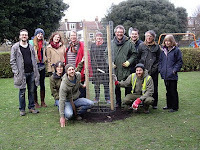 It's been two years since the first trees of our community orchard were planted. Our apple, pear and plum trees are thriving, thanks to the orchard group's tender loving care, so we felt it's time to celebrate! So please join us for the Wassail in the Pleasaunce on Sunday 6 January - everyone is welcome. We'll start with some mulching of the trees at 11.30am to help their root development - if you'd like to help with this, please bring a shovel or just your willing self. And supervised children are welcome to help, too. After that, the fun begins from 12 noon onwards - traditional wassailing songs, storytelling, socialising and mulled cider to warm the cockles, and as always Pistachios cafe will be serving hot food and drinks. If you're a musician or singer and you're interested in contributing your talents, we'd love to hear from you. For this or for any other information, contact Rich on 07833 538143. Don't know how to find the Pleasaunce? See the map below.